Agilent Technologies Inc. (NYSE: A) recently announced shipment of its first release of the industry-leading SPICE modeling tools it obtained through the acquisition of Accelicon Technologies in February. The tools - Model Builder Program (MBP), Model Quality Assurance (MQA) and Advanced Model Analysis (AMA) - are now an integral part of Agilent's device-modeling portfolio. "The release today unambiguously demonstrates our full and long-term commitment to MBP, MQA and AMA, all of which have enjoyed popular and unwavering support from our worldwide customer base," said Brian Chen, device modeling product manager with Agilent EEsof EDA. MBP 2012.07 offers turnkey solutions for SPICE model extraction. A rich set of powerful and unique features make it the tool of choice for high-volume, high-efficiency model generation at foundries and integrated device manufacturers, and for SPICE library customization at leading-edge fabless companies to enable concurrent circuit designs. MQA 2012.07 serves as a platform for performing automated, comprehensive and systematic SPICE model qualification. It is the de facto industry-standard tool for SPICE library signoff at foundries and IDMs, and for SPICE library acceptance in design houses. AMA 2012.07 meets the need for SPICE model and layout-versus-schematic covalidation for cutting-edge technologies where layout-dependent effects have become prevalent due to performance-enhancing processing techniques. "As the leading provider of semiconductor device-modeling solutions, we continue to innovate and improve workflow efficiency and model accuracy," said Chris Morton, device modeling business manager with Agilent EEsof EDA. "The full device-modeling portfolio from Agilent, which consists of IC-CAP/WaferPro, MBP, MQA and AMA, is the industry's only high-quality, high-efficiency turnkey solution for silicon modeling, from measurement to data analysis and from model generation to model qualification." The Model Builder Program provides both automation and flexibility for high-volume, high-throughput device modeling. MBP includes powerful, built-in characterization and modeling capabilities, as well as an open interface for modeling strategy customization. It is widely used both by semiconductor foundries and design houses to extract and customize SPICE model libraries. More information is available at www.agilent.com/find/eesof-mbp. 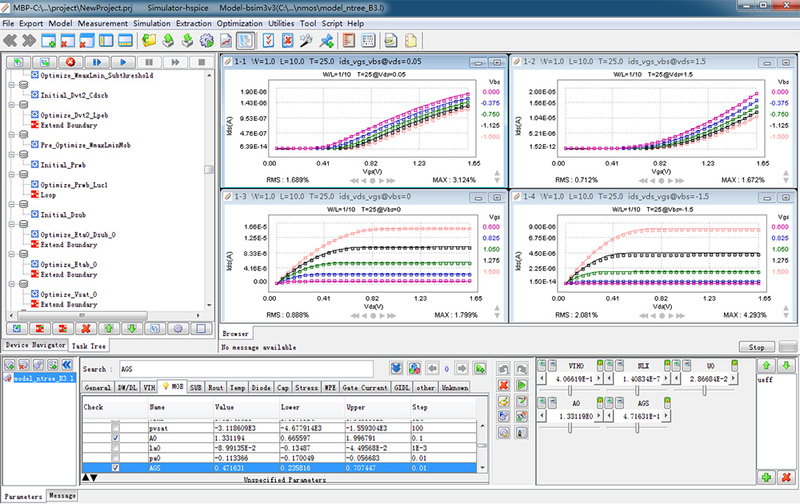 Model Quality Assurance software provides a complete solution and framework to fabless design companies, IDMs and foundries for SPICE model library validation, comparison and documentation. As the de facto industry standard SPICE model quality assurance tool, MQA automatically performs model quality assurance, comparison and documentation to ensure design success using advanced process technologies. More information is available at www.agilent.com/find/eesof-mqa. 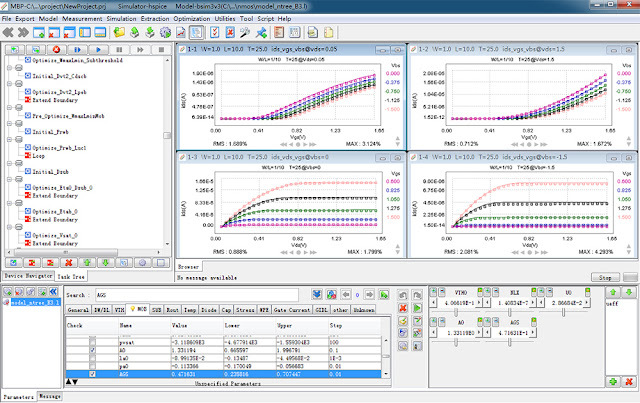 Advanced Model Analysis software performs model validation and analysis functions related to the layout-dependent effects in cutting-edge process technologies. It is the solution for covalidation of SPICE models and LVS decks. AMA integrates a complete flow, including layout generation, layout extraction, SPICE simulation, data analysis and reporting. More information is available at www.agilent.com/find/eesof-ama.